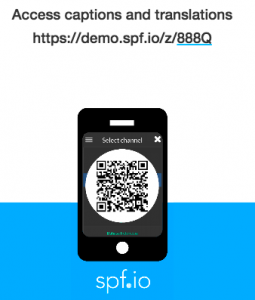 Q: Is there an easy way to share the spf.io mobile link with my audience? A: Yes! You can share the static link, which by default points to the last session created (learn more about the /z shortcut here). But alternatively, you can find out where to locate the specific link for your session here. In either case, we made it easy to share the link with your audience through the “Show instructions” button in the projector view, which you can display on a projector screen or print out ahead of time and put up at the venue. Under the Channels tab, select the language(s) you want the instructional poster to display (so if you want to display in Spanish, select “Español”). In the projector view, you should see something like the screen below. Share it with your audience on the projector screen or print the page and post it around the venue.